Please refer to our stock # LE-36 when inquiring. 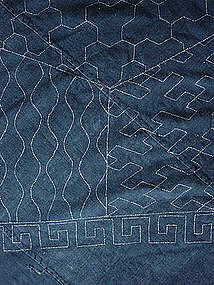 Furoshiki (Wrapping Cloth), Indigo-dyed with reinforced sashiko-embroidered corners. Additional center reinforcement panel. A few areas of repair mending and some small holes (please see detail images. )Early 20th Century. 79"(201cm) x 74"(188cm.) The contemporary image of furoshiki brings to mind a pleasantly printed small cloth the size of large handkerchief, used for wrapping one's bento (lunch box) or a small gift when visiting a friend. It is rare these days to see this type of furoshiki which was used to carry large loads, oftentimes on the backs of elderly women. This furoshiki also displays the craft of sashiko embroidery. Although a decorative technique, quilting also serves to strengthen, make repairs, and extend the life of textiles. Sashiko became highly developed in rural areas among farmers and fisherfolk, especially in the Tohoku (North East Honshu) region.